Please Explain is a Rio Olympics series (or maybe just this one post) in which I ask sports experts to explain a sport I am clueless about. Hopefully I will find experts to explain other sports to me. I’ve been secretly fascinated with fencing since high school, when a small group of my friends “played” the sport as part of their extracurriculars. I used to look at them with awe, like, “What are y’all doing? Lol.” Not out loud, just something I would say in my head. Alas, I never took the time to research fencing. I was always busy doing other things. But with the Rio Olympics currently underway—and fencing being one of the sports—now is a good time to educate myself. I must stay conscious through the madness and chaos. Sure, fencing looks cool but what exactly is it? Seeking answers, I reached out to Manhattan Fencing Center, which I learned has three fencers competing in the Olympics: Monica Aksamit, Dagmara Wonziak and a very good black fencer named Daryl Homer. Below is my interview with Sergey Isayenko, a fencing coach at MFC since the club opened in 2007—almost 11 years. Here’s what I learned. Jezebel: First off, there’s no fence? Why is it called fencing? Are there always only two players at a time or...? Yeah, ultimately it’s an individual sport, like a combat sport. So even if it’s a team, you still fence one-on-one. The points accumulate toward the team points. You’re fencing against one opponent all the time. What is the goal of the game? How does a player “win” in fencing? The ultimate goal for fencing is to hit somebody without ideally getting hit. So basically, you try to attack your opponent and try to steal his blade and hit him without getting hit. That’s the ultimate idea, but in reality, sometimes they both get hit. Whoever moves forward has the priority over the person who stays still or moves back. So if I move forward and I hit you while you stay still, it will be my priority. Is “priority” an official term? Right of way, priority—you can call it either way. The outfits and whole set-up look like Medieval Times, kind of. Why is this still a sport in this day? Where did it come from? Well, think of it like, that’s the protective gear so if you have any parts of the body that would be uncovered, you potentially may get hit there. That’s why when you look at the fencers, everything that’s exposed to the opponent is covered. So you have the arms, where you hold your weapons, that has gloves. The other hand is behind, so it’s not in the way of the opponent’s weapon. That’s why it’s only one glove. The other hand is ungloved. The rest of the body has to be covered in order for it not to be hurt when you get hit. Okay. So wait. Do you have to put your hand behind your back? Is that like a rule? The fencing position is designed in a way that you’re standing at a 45-degree angle towards your opponent. So you have the weapon in front of you and the other hand, you want it behind the upper body so it’s not in the way of the opponent hitting you. So to be clear, whoever gets the most hits basically is how you win. Well, in general terms, you have the five-touch bout, which is the preliminary round bout. And then you have 15-touch bout for the direct elimination bout. Depending on the stage of the competition—if it’s the beginning stage, you fence the pool rounds, which goes for five-touch bouts. And you generally have five, six people in the pool. After that, the results in the pool determine the seeding and then you’re put in the direct elimination table, where let’s say, your top-seeded fencer will fence the last-seeded fencer. Let’s say it’s a table of 64: the first fencer will fence the 64th fencer, the second fencer will fence the 63rd fencer and so forth. The direct elimination extends to 16 bouts. Okay. So the bendy sword thing, is it dangerous? Oh, the blade weighs about one pound so if you look at it, it doesn’t look very dangerous. But the fencing weapon is the second fastest weapon after the bullet [Ed Note: It’s true! ], so basically that’s the second fastest thing in the sport. If you get hit with a full swing, it hurts a lot. That’s why you learn how to defend, you learn how to attack, you have the protective gear. It’s not lethal, but in certain situations you may get hurt. Not serious injuries, just a few minor scratches. You learn how to defend yourself, so no it doesn’t happen that often and if it does it’s more like some kind of freak incident. Sometimes people get poked through the glove so they changed the rules and the gloves are a little thicker so it’s almost almost impossible to get pierced through it. Every time something happens, the rules modify towards the fact that it’s safer and safer. So no beheadings in fencing. What makes it a sport? Athletically…what does it require? I mean, you see the final product and it looks very graceful and smooth and so forth, but behind that there’s a tremendous amount of work. You have to train your change of direction, so your legs have to be very strong in order for it to be able to keep the balance. You have to have very strong leg muscles, back, abs and obliques to maintain your body upright. Huge agility, being able to transition from full speed forward to full speed back, being able to fend yourself at full speed lunge and then recover back and run away from an opponent’s attack. It’s a very, very fast paced thing so the muscles are burning when you’re doing fencing. Okay. I keep seeing this word épée. Can you explain that? There are three different weapons. Each weapon has a different target area. So there’s foil, there’s épée and there’s sabre. Épée is the original dueling weapon, so the entire body is the target area. Foil was the practice weapon to practice dueling safely, so the target area is only the torso. These two weapons, you’re allowed only to thrust. You cannot slash. You can only score with the tip of the weapon. Whereas, sabre is the slashing and thrusting weapon and the target area is above the waist. People tend to believe the sabre is the fastest weapon, épée would be the slowest weapon and foil is somewhere in between. Got it. [Ed Note: I must confess, I did not get it at the time of the interview. I thought Sergey was saying “flashing” and then wisely looked it up while transcribing this interview. UPDATE: Turns out, I was still wrong. I’ve updated the copy to change “flèche” to “slash.”] Who are the fencers to watch in the Rio Olympics? So far, we have one silver medal from Alexander Massialas. That’s the first male medal since 1984 for the United States. So it is a big deal. Okay. Yeah. 1984? So we’re not that great in fencing, basically. Oh wow. That’s great. What about the women’s side? The women’s side finished and our fencer that represented Manhattan Fencing and the United States team lost against the Greek fencer. Right. How long does a fencing career last? Can you do it for awhile? As the sport gets more and more specialized, people start earlier and earlier. People start around eight. You’ll see in sabre fencing for example, prime results generally fall in the age of 25 or so. You don’t see that many people after the age of 30 in men’s sabre because it’s very fast-paced. Eventually, once you get older, injuries start to catch up. Whereas in épée fencing, it’s normal to see people after 30 because it’s almost like grape wine, it gets better with age. So people start getting better after the age of 30 and they become wise, smart. They may move not as fast, but they become a very smart fencer so in épée .The career lasts a little longer. In foil, it’s probably somewhere a little closer to 30. 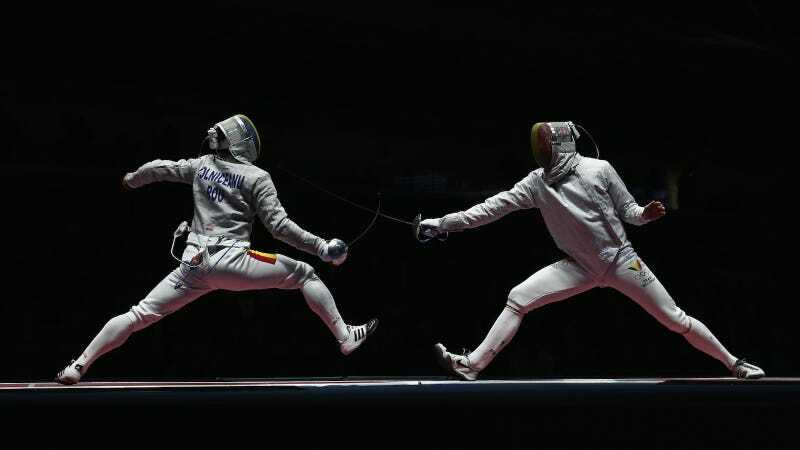 In the United States, it seems like fencing careers finish most of the time after college. A lot of fencers stop progressing so their best result is age 16 and 17. Our team is probably by far the youngest out of all the fencing teams in the world. So in epee, age is a weapon. Cool. Anything you want to know about fencing that they’re confused about or questions you get a lot? I would say come try us at Manhattan Fencing Center. We have a bunch of different age groups, for the beginner, adults, little kids and so forth. The best way to practice is simply try it and then you’ll answer your own questions on the spot. Because it’s almost impossible to explain it in front of you on the fingers. It’s much easier to explain it right in the battle. Lastly, when you watch movies like Lord of the Rings or Game of Thrones, do you think about fencing? Unfortunately, that has almost nothing to do with real fencing. It’s staged fencing, so they practice certain moves, but they’re not designed to actually hit somebody. They’re designed to make it look cool.